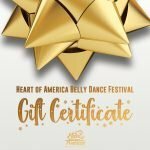 2016 Heart of America Belly Dance Competition in Overland Park, KS. Winner, Carlyn, dancing in the 2nd and final round. Judges Aziza of Cairo, Madam Raqia Hassan and Sammia Du of China.